A plan for Congress to use a stopgap spending measure to keep government funding at the same level for six months would snub a long list of appropriations — including one that could keep the roof from falling in. 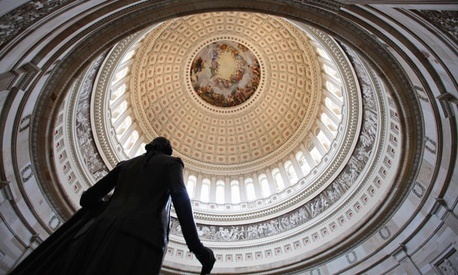 The Capitol Dome needs a $61 million repair job that would plug leaking holes, fix water damage, and secure ornaments that have loosened over the years, according to the Architect of the Capitol. But the Senate worked to speed the repair process along last week, when Sens. Ben Nelson, D-Neb., and John Hoeven, R-N.D., chairman and ranking member, respectively, of the Senate Appropriations Subcommittee on the Legislative Branch, sponsored and passed an amendment in their committee to restore the funding. However, the six-month continuing resolution that Congress is expected to take up after the August recess would keep the government running at current funding levels through March — prohibiting any the addition or subtraction of any funding through the appropriations process from going into effect. Concern is growing among architects and engineers off the Hill as the wait for funding to refurbish the dome continues. Planners hope to complete the four-year project before the next presidential inauguration in 2017 to keep the symbol pristine during the event, which means work must begin by February. And there are other concerns as well. “There is a potential of safety issues when you’re talking about leaks and cracks,” said Andrew Goldberg of The American Institute of Architects. He added that the costs could increase if the project is put off. “The rule of thumb is that the cost of deferring maintenance is 15 times more when [something] does break,” he said.